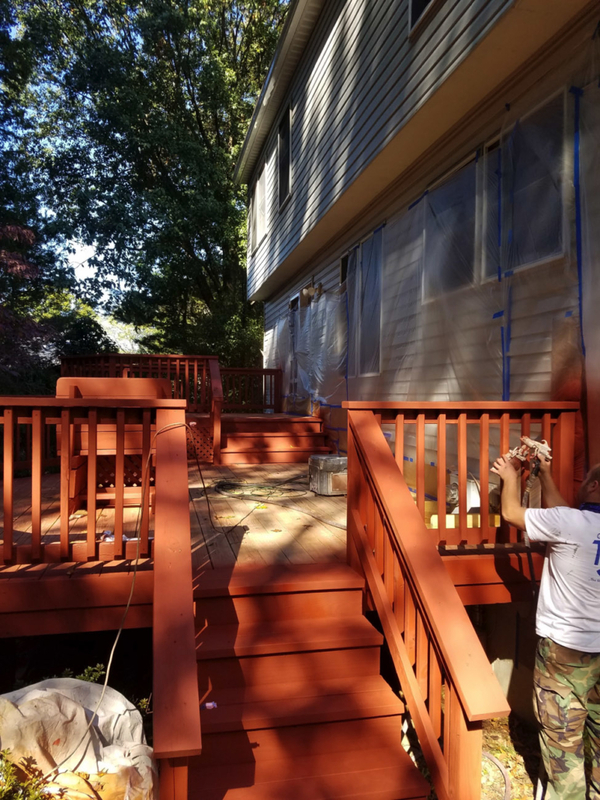 At Patrick’s Painting & Home Improvement, we have been staining decks for over 12 years and have been certified by the Deck Restoration Institute. 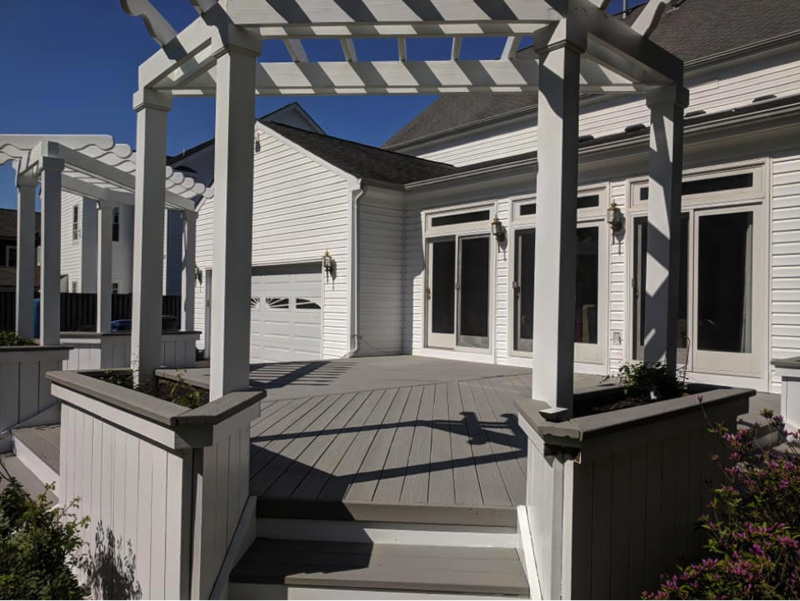 We have a proven process to ensure the wood has been properly cleaned, the stain has been evenly applied, and that it will enhance the look of your exterior living space. 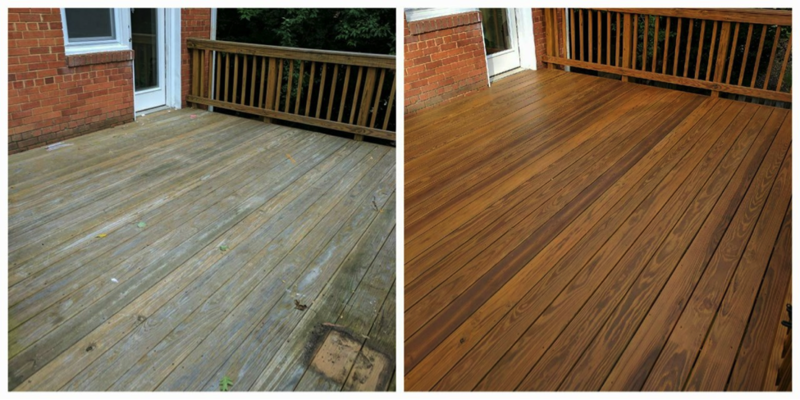 The Average a Stained deck will last. The Average an Un-Stained deck will last. 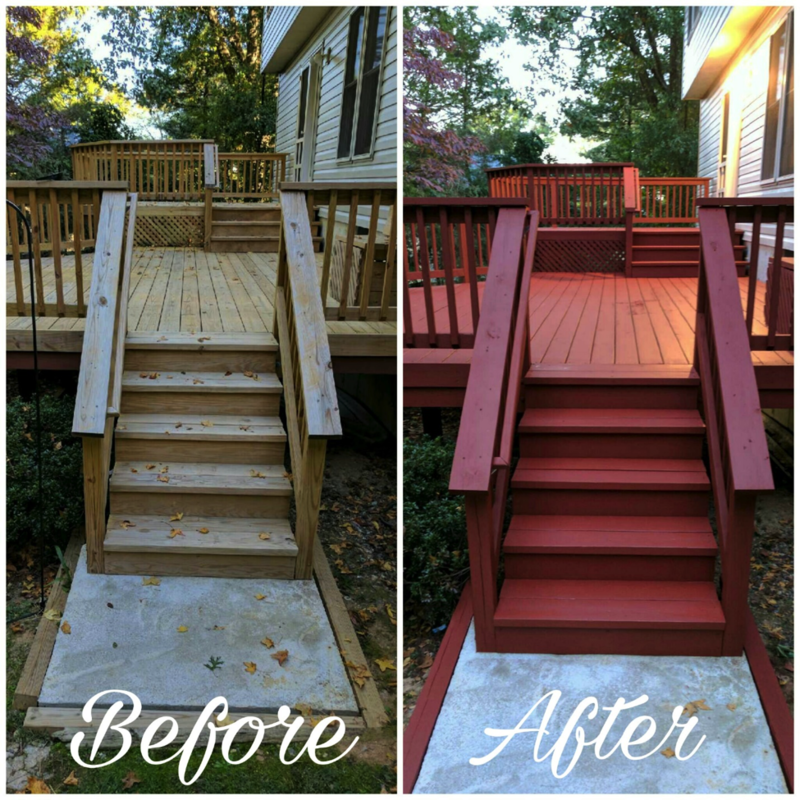 Why is Deck & fence Staining important? 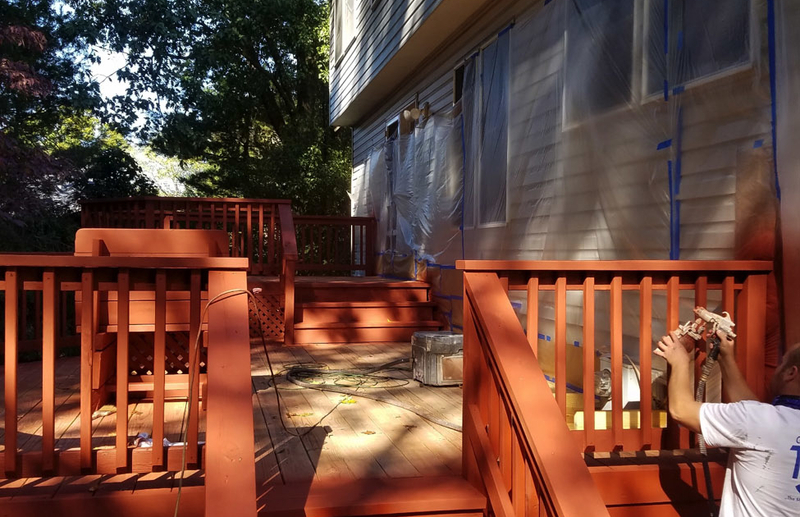 All wooden decks and fences require maintenance if you want to preserve the wood color, the integrity of the wood, and longevity of the structure. 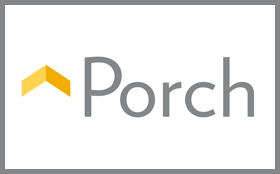 Your deck is outside all year long and deals with the heat, UV rays, snow, and rain. These are the most common factors that will break down the wood along with foot and animal traffic. What type of stain should I use? There are two factors you need to consider when choosing a stain- how long the stain will last and the look you are trying to achieve. 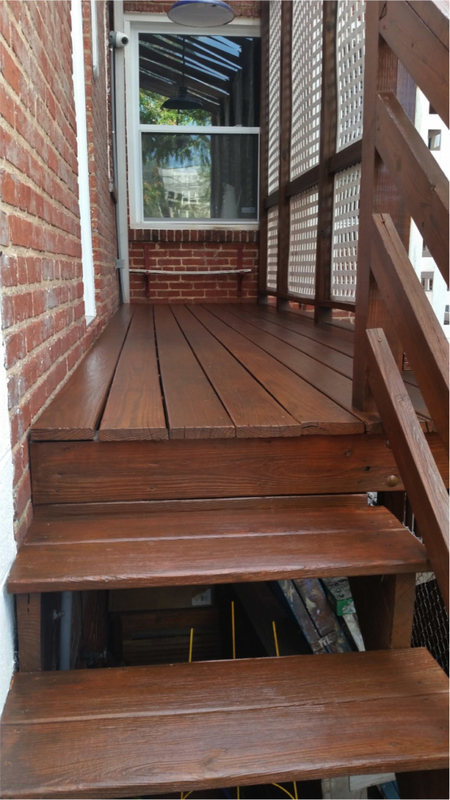 Below is a list of stains to consider when treating your deck. This allows you to see the grain of wood in full while enhancing the color of the wood. You can get anywhere from 2-5 years out of a transparent stain depending on the quality of the stain and whether the surface being stained is vertical or horizontal. Vertical surfaces will always last longer. 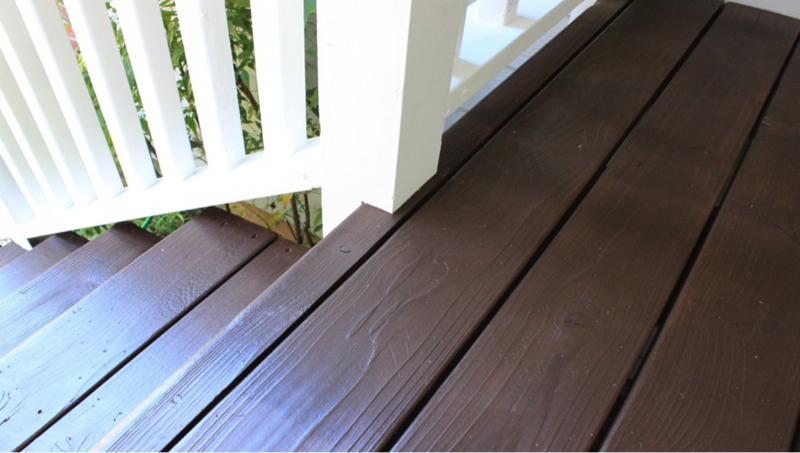 This is the most popular stain for newly built decks and fences because the stain really makes the wood come to life. The most popular colors we use are Natural and Cedar. 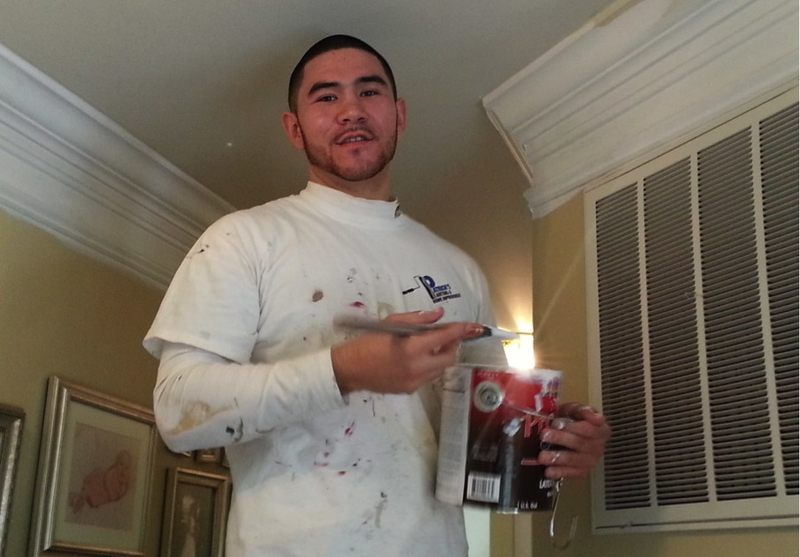 We prefer the Behr Premium Transparent stain in the waterborne formula. Left: Before our cleaning solution has been applied & pressure washing has been done. Right: After we have stained using a natural transparent stain. The semi-transparent still allows you to see the gain but just not as well as the transparent hint the name SEMI-TRANSPARENT. We can generally get 3-5 years out of this stain. We use this product on many new and previously treated decks and fences and is the 2nd most popular stain. The Semi-transparent stain come in over 30 different colors. The solid stain covers the wood grain in full like paint but is not as thick as a paint allowing the wood to breathe. You generally can get anywhere from 4-8 years out of this stain. 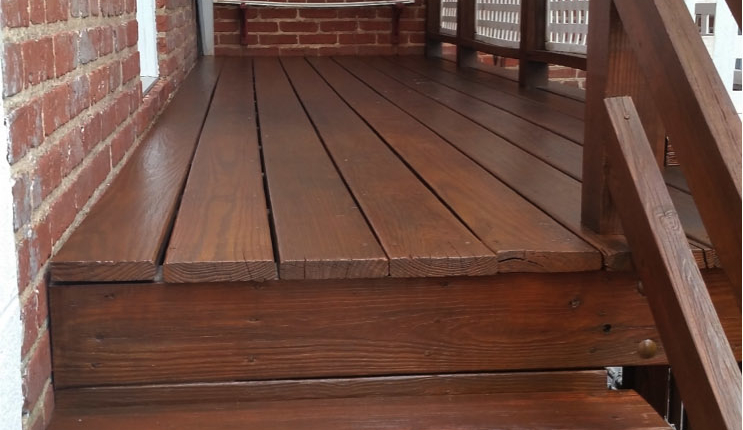 This stain is mainly used on decks and fences the appearance of the wood isn’t too much of a big deal and you just want a stain to hold up as long as possible and protect the wood. We prefer the Super Deck Solid stain from Sherwin Williams. Left: Before our cleaning solution and pressure washing process. Right: After applying the Redwood Solid Stain. The SDD is a high build coating allowing the product to fill cracks better. It is also flexible so when the deck becomes hot the product expands and when it becomes cold it contracts. This is great because it prevents things from peeling and cracking often. The manufacturer recommends applying 2 coats when first treating then cleaning and applying another coat every 12 years. We have been only using this product since 2014 but so far have had great success with it. We use this product on decks and fence that you don’t want to treat often or are severely deteriorated. It is also a great product to use on Docks or concrete. The SDD is a product by Super Deck now owned by Sherwin Williams. Most of our clients tend to upgrade to the SDD over a solid stain because it lasts much longer and is the same look. This deck was treated with the SDD coating using an Extra White color and Graystone 1475 color. 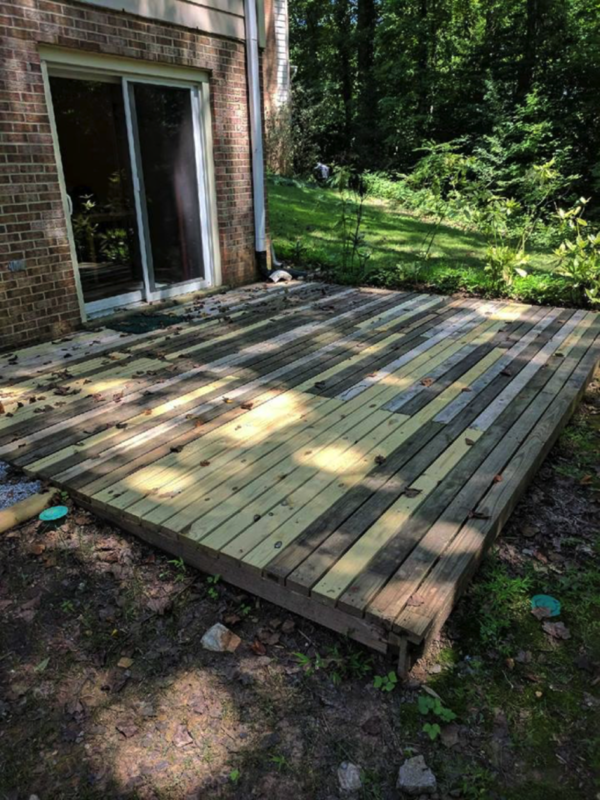 How do we prepare the deck for staining? 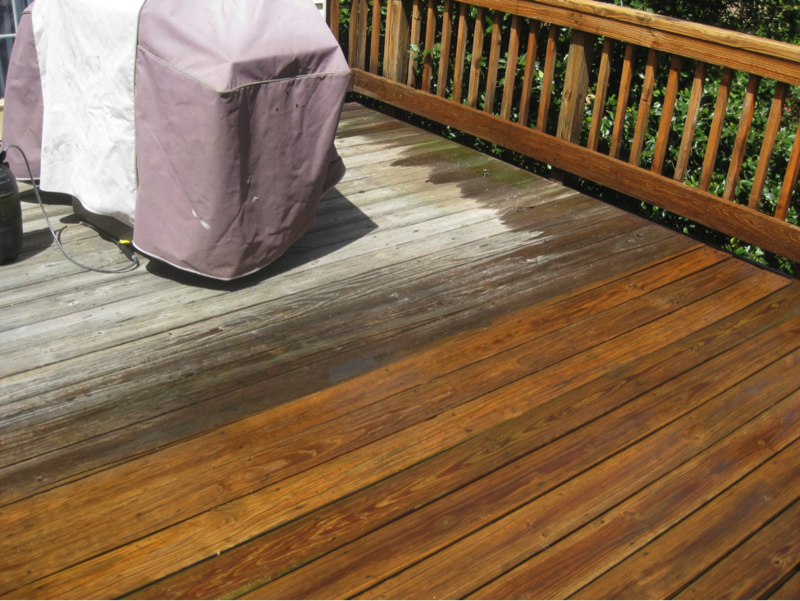 When treating new or old wood we always pressure wash. Before pressure washing, we apply a solution that best fits your deck or fences needs. The 3 products we use are metasilicate (cleaning agent/mild paint stripper), Sodium Percarbonate (active ingredients in OxyClean) and Oxalic Acid (used in almost all standard wood cleaners, brightens and neutralizes the PH). We mix these products ourselves to control the potency. All of these products help clean your wood but work differently. They will not harm your plants, animals, or yourself. After we apply the cleaning products and let it sit (dwell) on the wood for 5-10 minutes then begin to pressure wash the wood. When we pressure wash we make sure we are not going to close to the wood making it splinter/damaging it nor too far away from where we aren’t properly cleaning it. We find the sweet spot that properly cleans without damaging. Some decks will require sanding which we can accommodate for as well. Before we begin our cleaning process, we replace any rotten/deteriorated wood. We have many different sizes of pressure treated boards at our shop that have already weathered so we can install immediately. 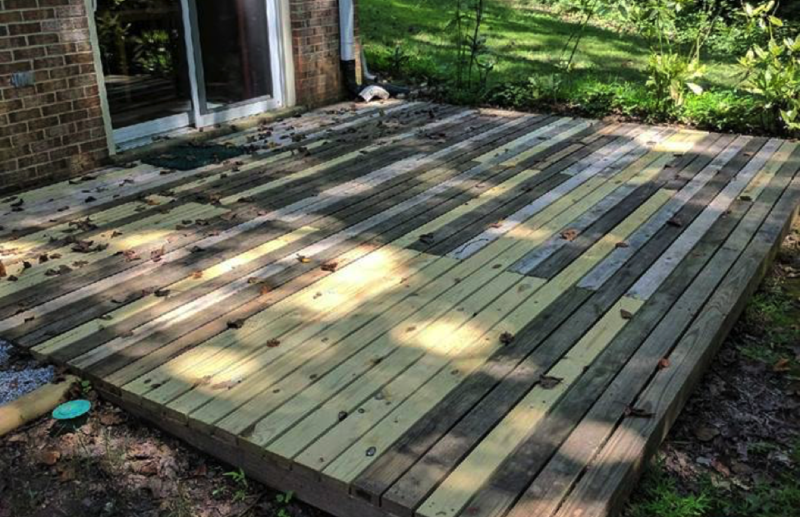 If we were to go straight to a lumber yard (Home Depot, Lowes, Smoot) and install that piece of wood to the deck or fence we would need to wait 3-6 months before it has weathered. Weathered means that the wood has dried out enough and is acceptable for stain. We test the wood using a moisture meter to make sure it is under 20% moisture content before treating. In our standard process we will go around the entire deck or fence and hammer down any nails that are popping out. Any loose or warped boards we will install new exterior screws into. Screws have threads which hold the wood in place much better than nails. How do we apply the stain? It depends on the situation but the majority of the time we use an airless spray regulator and back brush all of the stain. The sprayer applies the stain quickly and back brushing ensures evenly applied stain and penetration into the wood. 90% of the decks we treat are made of a soft wood this is generally pressure treated Pine. Hardwoods consist of Teak, Mahogany, IPE, etc. Hardwoods have the same cleaning process as softwoods but we use a different type of stain, this is always oil base and 1 coat. We only use 1 coat because the wood is so dense the 2nd coat will not absorb. Hardwood decks need to be treated every 1-2 years to maintain the beautiful look of the species of wood being treated. 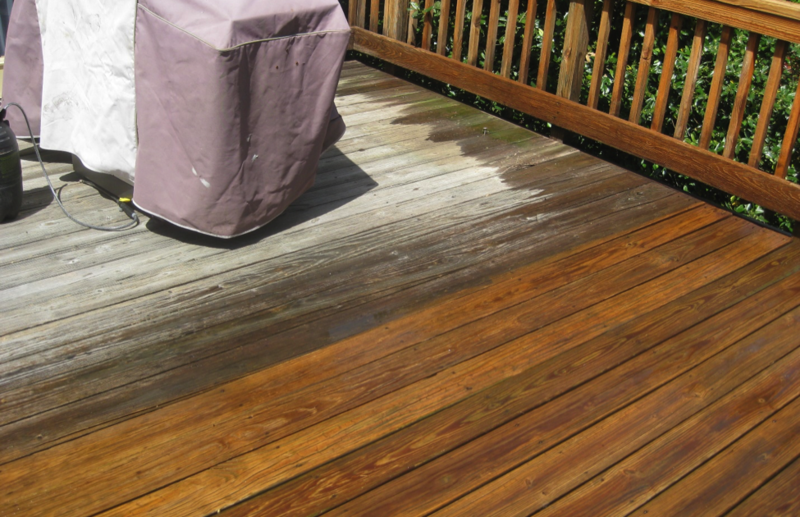 If you are planning on treating your deck yourself, you must ensure the wood is clean enough for the stain to adhere. Don’t use any cheap stains like Thompson’s Water Seal or Flood, they will not last long. If you need help with your project I, Patrick Coye, would be happy to come out and assess your project and provide you with a free quote.